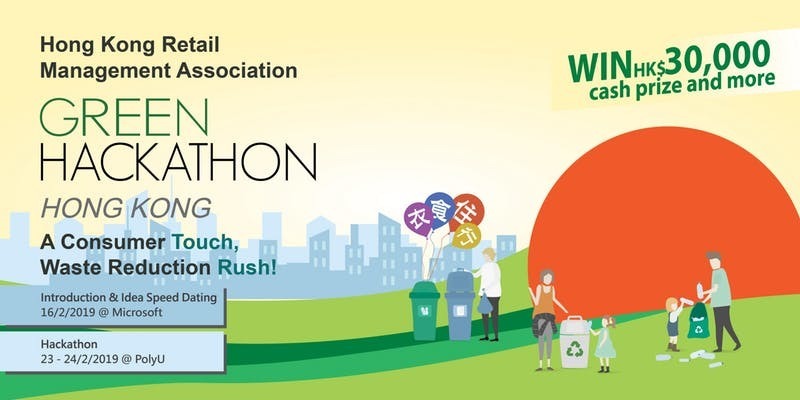 The hackathon aims to bring retailers and young people together to develop ideas that can be applied in retail shops to promote customers' awareness and practices to protect the environment. Problem Statement: How to influence consumer at customer touch points that would empower them to minimise waste in consumption through reduce, reuse & recycle. A separate google registration form will be sent to you after summiting in Eventbrite. Go to our GREEN HACKATHON for more updated information on prizes. For further enquiries, pls contact Max Leung at hkgh@hkrma.org. Are there ID or minimum age requirements to enter the hackathon? We welcome local and overseas universities students and young alumni, also startup teams in Hong Kong. I register Green Warrior track (University student/ young alumni). How can I get back the deposit of the registration fee? Participants are not allowed to leave the designated premises for more than three (3) hours, during the Hackathon and the Introduction, unless with the special consent from HKRMA. We will give back the deposit after the pitching. However we do NOT refund "no shows", i.e. if you register for the event but do not show up for Green Hackathon, we will NOT refund your deposit back. Therefore if you know that you cannot make it to the event, please contact hkgh@hkrma.org on or before Friday, 13 February 2019, 6 pm. No. However please make sure that the name you used to register for the event is EXACTLY the same as that in a valid government-issued ID, e.g. Hong Kong Identity Card, passport issued by a foreign government body, etc. I don't have a team. Can I still join? You must have a team to join. If you do not have a team, you could find a team or team members in the Team Forming session on the first day of the event, 16/2/2019. A team must consist of at least two (2) and no more than four (4) participants. Do I need to submit anything before the event? You have to fill in a form that will be sent to you via email. You could bring your own computer, tablet etc electronic device. Remember to bring your own food container, cup, bottle and cutlery. The name on your registration must EXACTLY MATCH that on an official government-issued ID, e.g. Hong Kong Identity Card, passport issued by a foreign government body, etc. We reserve the right to refuse entry if we do not find your name on our registration list, so please reserve your spot here and make sure that the name on your ID exactly matches that in our registration list.